Top o’ the mornin’ to ya folks!! Okay, okay...so I’m not Irish...but I can still enjoy the traditional celebration of St. Patrick’s Day. This will be the theme underlying many of the activities taking place in all of our Masonic bodies and elsewhere. I want to remind everyone that we have the Maundy Thursday Observance Event coming up on the 28th of this month. I think you’ll find the ceremony moving and informative. Please be sure to call in your reservation for dinner. As most of you know, the Chapter of Rose Croix doesn’t close during the year. It is always called from Labor to Refreshment. This is the exception. This is the one time that it actually closes and stays closed until it is reopened on Easter. Through the ages men have observed sacred rites during the solstice and equinoxes. The Last Supper was an observance of the Passover (Spring Equinox) just prior to the betrayal and crucifixion of Christ. The Chapter of Rose Croix having an observance of Maundy Thursday in the Eighteenth Degree of the Scottish Rite is appropriate since this degree originally was one of orthodox Christianity. The Maundy Thursday observance was added and made obligatory when the authority of the Supreme Council revised the Degree soon after the Civil War. It is no longer obligatory. I want to thank those in the cast for “stepping up to the plate” to make this a successful event. I really do appreciate it. Next month we’ll begin the conferral of our Degrees. There’s much to do and sometimes the load can seem a lot....but if we all do our share, it will certainly not be more than we can handle. If you’re interested in taking part in any of the degrees, just let us know. 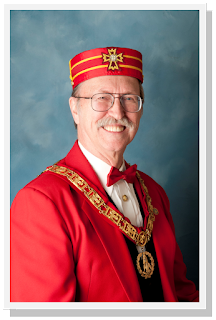 William Jennings Bryan said, “If a man measures life by what others do for him, he is apt to be disappointed; but if he measures life by what he does for others, there is no time for despair.” I encourage you to take part in all of our Scottish Rite activities. See you on Tuesday night!